The Visual Science Lab / Kirk Tuck: Yesterday's Historic Assignment. New camera, old artifacts. Yesterday's Historic Assignment. New camera, old artifacts. 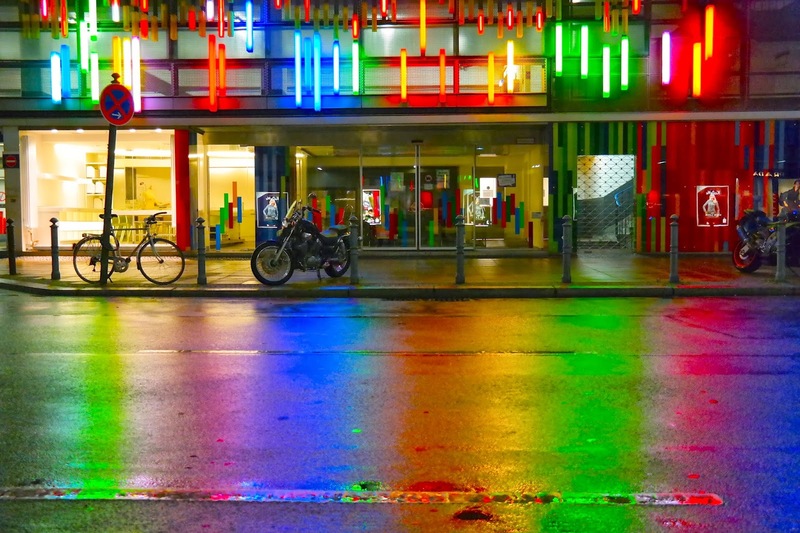 This image of a Berlin street is included solely for blog decoration. It has nothing to do with the content below. and the solid little kit lens. I like the pretty colors. I've said recently that we've been busy over the last two weeks. Last Weds. I spent a full day making wonderful available light portraits for a software company in a downtown bank building. I spent most of the next day doing the necessary post production and also having phone meetings about upcoming video production. Yesterday I had the good fortune to spend most of the day on an assignment for the Bob Bullock Texas State History Museum. It was a straightforward job but one that was almost meditative and very satisfying. The museum has a constant influx of artifacts that need to be well documented and I've been providing photographic documentation for them throughout this year. Since nearly every object must be kept on the museum grounds and can usually only be handled by a curator wearing gloves we definitely do each of these assignments on their turf. All of the artifacts are photographed on white backgrounds and during post production I create very detailed clipping paths so they can drop out backgrounds where necessary. Yesterday I loaded up the Airport Security case with the Nikon 7100 camera. A 35mm lens, a 50mm lens, a 55mm f2.8 manual focus micro lens and the wild kit zoom. I had a back up battery and, in case of catastrophic system failure, I had a Panasonic GH4 with assorted lenses in reserve. I also brought along a flash meter, gaffer's tape and some black wrap. Always black wrap. As an afterthought I tossed in two Yongnuo slave-able flashes. In another case I had four Elinchrom moonlights with cables and speed rings and accessories. In the stand bag were a couple of soft boxes, a few umbrellas and my little, Benro tripod. Riding along with no case was a stout, tall C-Stand with an arm. It was joined by a thirty pound sand bag. I also brought along assorted chunks of white foamcore and black foamcore which is wonderful when you need to add or subtract light from a composition. I wheeled the case in right at 9am and we got set up with a white background sweep table in one of the big work rooms on the first floor. I used a medium sized (3 feet by 4 feet) soft box on the C-Stand's side arm (using it as a boom) and positioned it directly above the set. I used this light for almost everything, repositioning it and fine tuning it to match the subject matter. Occasionally I wanted to supplement the top light with fill from a spot near the camera position. I grabbed a Yongnuo flash, set it to "slave" mode and aimed it into a 42 inch white umbrella with a black cover. Being able to dial the power levels up and down and to not work about radio triggers or cords was efficient. As I intended I used the D7100 and the 55 macro lens for just about everything. I wanted to see if the combination of a "known" great lens and the 24 megapixel sensor with no anti-aliasing filter would give my images some sort of extra mojo. Having now imported everything into Lightroom I can see that the images, shot at 100 ISO with the lens at f5.6 to f8.0, are sharper than what I had previously gotten with good lenses on the full frame, 24 megapixel Sony a99 camera. Score one of the APS-C, next generation. My working method was to set the camera to the live view mode, zoom in to 8x or so to fine focus and then shoot a single frame, chimp the hell out of it, make whatever course corrections were necessary and then shoot two more frames: one to use and one as a safety. This shooting method ameliorates any battery advantages of OVF cameras and, as expected, I ate up 50% of the battery charge getting about 125 shots done over the course of five hours. I was also surprised to see, already, a dust bunny appear when we started veering toward f11.5+ to get more depth of field in shots of really small objects. I haven't seen dust on the sensor of a Panasonic or Olympus camera in.....forever. I did take time to shoot several of the images with the Panasonic GH4 and the 12-35mm lens. I wanted a direct comparison I could mull over. Here's what I found: The Nikon D7100 has a resolution advantage and the files seem more color correct right out of camera. If you were going to make huge paper enlargements the judges would immediately side with the bigger sensor-ed camera. But, at our final delivery size the advantages disappear (or are equalized by the common denominator of size). From a working perspective I will probably switch back to micro four thirds for the next round of artifact documentation at the museum. There is a distinct advantage to the additional depth of field at the same angle of view when you are working in tight with a subject. Also, cameras that are designed to be in permanent "live view" via their EVFs are much more facile in operations like this with much faster focusing. Finally, I've gotten spoiled by the touch screens. Being able to touch the screen at the spot at which you'd like to see the focusing point is wonderful. You read a lot about the "overwhelming" superiority of one system or sensor class over another and even the most level headed among us can succumb to moments of doubt as to whether they've made good equipment choices. That's why I feel it's important to test things out first hand. To see what the reality of a comparison is. The nature of writing and blogging leads writers to exaggerate small differences to provide more exciting contrast in the written content. Nothing sells like bold statements and controversy. But once again I've found that careful lighting and technique are far more important than camera attributes and, that at conventional working sizes, the cameras and their files are less different than the fans and the manufacturers would like you to believe. Tonight I'm diving into the Nikon flash system. That may be an area where real differences make themselves known... But we'll see. Objectively. Is there a particular reason why you chose flash for shooting the artifacts? When doing something similar for a collection of 19th and early 20th century university science artifacts I went with Magyvered continuous lighting (42 watt CFLs in hardware-store reflectors behind layers of theatrical diffusion); should I have gotten out the portable flashes? Hi TC, I used fluorescents last time and I had a battle with a set of off color ceiling mounted fluorscents that interfered with my well balanced pro flos. I wanted to totally control a unified color temperature so I wanted to over power any building lights I could not turn off. Can't use regular hot lights because of the high IR and heat along with a dose of UV. The Elinchroms have UV coated tubes and the color consistency is all about on custom white balance and then don't worry. Been a while since I used flash for this stuff and it's just like falling off a bicycle onto a supermodel. Not bad. Wow - I hadn't even thought about not being able to turn room lights off, let alone exposing artifacts to UV! (Not, I should hasten to add, that the brass stuff I photographed a few years ago was particularly UV sensitive...) That makes total sense - thanks for taking the time to reply. Whoa, that's quite a blast of color, remarkable image. I like the term "blog decoration". Worst Best Zoom Lens I've Played With Lately.